In general, most people love having sheep as pets, because they’re gentle, calm and playful. Many also like sheep because their fleece can be used to make different types of clothing. In the Chinese zodiac however, those born on the year of the sheep are generally described as very much comfortable with their own minds, and are usually creative individuals. This means they make talented, and profitable, artisans and craftsmen, as well as teachers (and even businessmen). Let’s dig deeper into the fortunes, along with the potential downsides and pitfalls, of those born on the year of the sheep. Ranked 8th on the Chinese Zodiac, Sheep or goats are known good nurturers. They have a certain desire for caring for other people. They are quite well-known for their calmness and being reserved. They like large crowds and having fun. However, they don’t want to be in the limelight. They prefer to watch everything on the sides while their friends are the center of attention. They are perfect in keeping peace and finishing every task assigned to them. Home is the most comfortable place for these individuals. Sheep are free to express their artistic side at home through cooking, painting or any activities that can enhance their artistic nature. They love to laze around, and the couch is the ideal place to do so. Because of the sheep’s calm personality, they have fewer physical problems. They seem to be fragile individuals but on the inside, they are physically fit individuals. One thing that keeps them in a good state is happiness. Nevertheless, when they have their hearts broken, or if they become upset, they easily acquire various diseases. Chinese zodiac signs for sheep find it comfortable to be around the crowd. They like to give out opinions and helpful information, but they do not have the intention of being the leader. If requested, they will accept the leadership role, but as whole they are contented just being a member of the team. Status and power are the last thing on their mind, and they do not find it very important. Individuals from this sign are family-loving. They do not like being lonely. Partners for this Chinese sign should like big families since Sheep like children. They are willing to give a hundred percent to the right lover, and they are able to maintain a loving, stable and merry relationship. 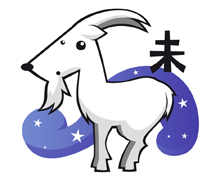 For those born in the year of the sheep, let’s start with the strengths and positive traits. First, sheep are creative, well-organized, and find lots of riches in their own imagination. They are kind-hearted, polite and tender too, and because of their creative nature, they will certainly have extra sensitivity to art and beauty. They can also be good at business, because they naturally act with caution and circumspect, and are economical with their finances too. For their weaknesses, sheep can be moody and pessimistic at times. They can also be indecisive, over-sensitive, moody and shy. They also tend to tend to like flattery, as well as get a lot of compliments and suggestions from friends. When it comes to romance, sheep also find it hard to express their love or intentions openly. Metal Sheep (1931 & 1991) - Sheep from the metal element have very hard exteriors, but they are very fragile in nature. The only people who know of the Sheep’s sensitive side is their family and close friends. This people hold high regards when it comes to arts and culture. Water Sheep (1943 & 2003) - Same as their element, a water sheep simply accepts the flow of various things. They are pretty contented and enjoy evening walks. They are ideal roommates and comrades, since they are pretty approachable and friendly. Wood Sheep (1955 & 2005) - They are always surrounded with large crowds or friends. Lots of individuals like to hang out with wood sheep since they are very generous and empathetic. Individuals from this sign need to control their feelings of giving since they might be deceived by cunning people. Fire Sheep (1907 & 1967) - They don’t get hurt quickly. They are capable of thinking about themselves and making themselves top priority. They are the Sheep, who fancy being on stage and performing. They are full of charisma and highly-spirited. Earth Sheep (1919 & 1979) - Chinese zodiac sign for sheep from the earth element are stable individuals but lacks confidence. They are more of a conversationalist than being liberal. Family is their most-treasured inheritance. They work hard in providing their family’s needs. Those born on the year of the sheep will generally have a great 2014. They will be presented with lots of opportunities, both in work and business, as well as in love and romance. However, they will still need to look out for a few potential hits and misses. Let’s take a glimpse at some of the predictions for sheep this year. Money and Work – Sheep will enjoy a wonderful career this year. Although stress will still be a problem, they will be able to make it through the toughest periods, and they’ll gain more experience too, as well as get that much-needed promotion. Sheep however are advised at investing in high-risk projects or stocks, as speculation will bring nothing but bad luck this year. Health and Wellness – Sheep will generally have a healthy and active 2014. But for those who have suffered from certain ailments or infections, recovery should be quick and successful. Sheep are also reminded to maintain a healthy diet, and drinking alcohol should be reduced, or considerably lessened this year, or else their live and gall bladder will suffer. And because most sheep easily feel lonely, they would need to further engage in social activities, and spend less time alone. They need to remember that too much sulking and crying, and all that negative emotion, is going to have a heavy toll on their physical and mental health. For love and romance, single sheep will be able to meet the love of their lives, this year. And once they are face to face with Mr. or Ms. Right, they should be open about what they truly feel. Married sheep however, should be wary of impending extramarital affairs, and a couple of arguments and verbal tussles ahead.